That's it. Pack it up and go home because Trick or Treat Studios just won the game of awesomeness with their reveal of Gizmo from Gremlins. 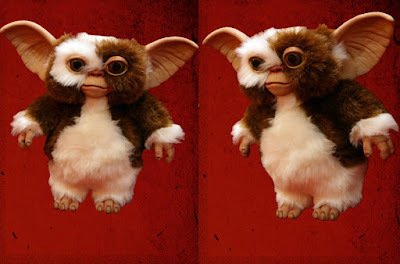 Trick or Treat's Gizmo Puppet was designed by Russ Lukich who used a laser scan directly off the screen used Gizmo Puppet from his personal collection. Absolutely every detail of Gizmo is present in this incredible hand puppet. From his dimensions to his hair, this is as close as you'll ever come to having the actual Gizmo Prop in hand. That right there is why Trick or Treat is killing the game of masks and props. The detail in that image above is something that I, personally, have wanted for a long time. If you feel the same then you need to act quick, because who knows how long these will be available.